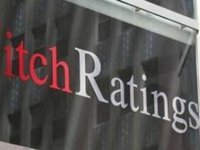 Fitch Ratings has upgraded NJSC Naftogaz Ukrainy's Long-Term Foreign-and Local-Currency Issuer Default Ratings (IDR) to 'B-' from 'CCC' with stable outlook, according to a report posted on the website of the rating agency on Tuesday. According to the document, the upgrade of Naftogaz's IDRs follows Fitch's reassessment of its standalone credit profile (SCP) and linkage with Ukraine under Fitch's Government-Related Entities Rating Criteria published on February 7, 2018, the favorable Stockholm arbitration ruling on its multi-billion dollar litigation with Russia's Gazprom and recent improvements in its financial profile. As reported, Naftogaz plans to enter the eurobond market in 2018 and expects that investors would positively react to this step, as the company sees profits, its investment and production grew, and the company won the litigation with Gazprom.